Select a discount by clicking on the corresponding image, and select a size and colour for your sticker. Very easy to apply and if ordered on static-cling film, easy to remove, and can be re-used. 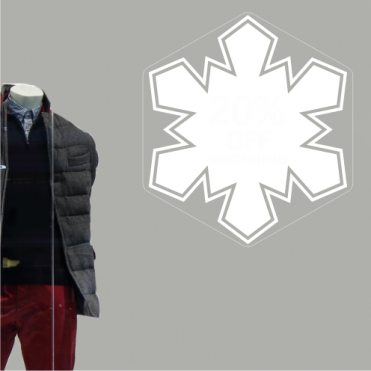 Sale Snowflake shop window stickers ideal for retail outlets. The stickers can be ordered in a choice of colours, sizes and materials. They can be applied to glass or any other smooth, flat surface including plastic, metal and wood (self adhesive). When ordering, you can select the aspect of the sticker depending on whether you intend to apply the sticker on the glass internally, to be viewed and read externally (print in reverse), or applied externally or on a surace other than glass, to be read face on as a conventional design (print as seen). We recommend self-adhesive film for long term applications as it's more durable and less prone to being picked away. The self-cling window stickers are re-usable, and peel off in seconds without tools.